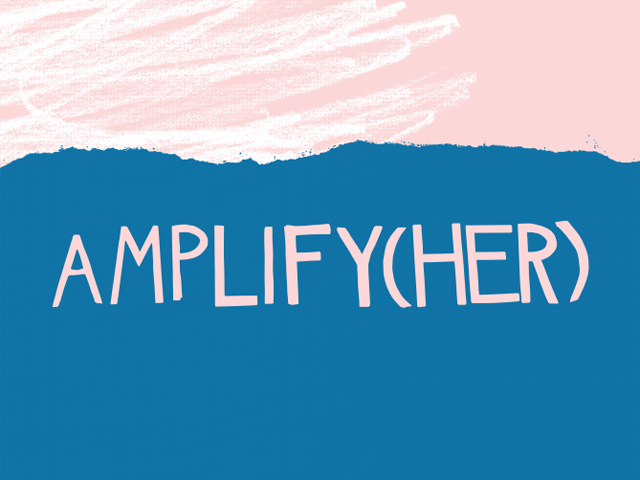 Amplify(HER) is a counter-narrative project, a collaboration between RAISE (Revolutionizing Asian American Immigrant Stories on the East Coast) and DRUM South Asian Organizing Center, featuring work by and for undocumented women of the Asian Diaspora. 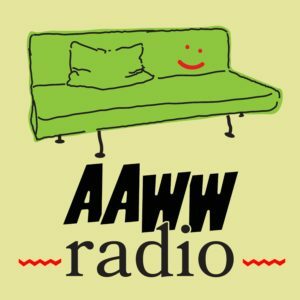 In September 2016, Amplify(HER) held a launch party for its inaugural issue here at AAWW. 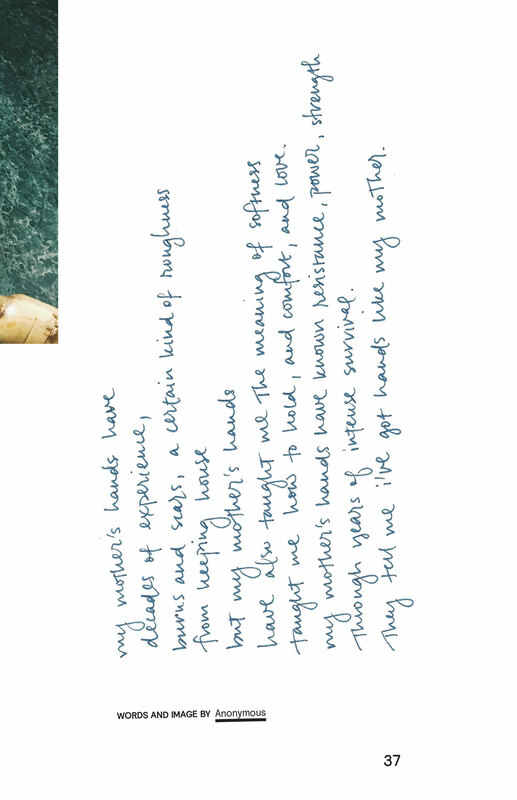 The following is a selection of artwork and writing published in the zine, reproduced with permission. 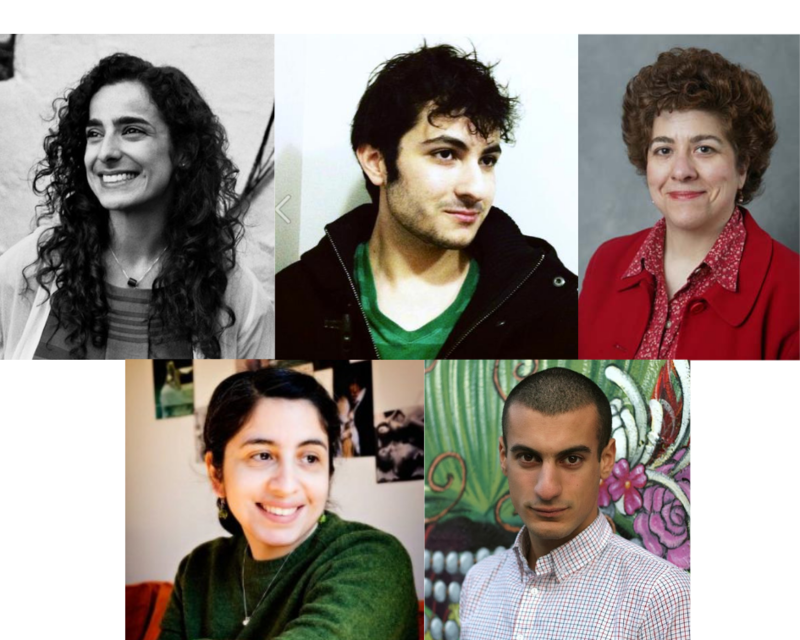 Spanning a wide variety of topics and experiences, contributors tell fraught and intergenerational stories of identity and survival. I was slowly drowning and was relentlessly starting to lose motivation. I wanted to feel like this burden was not being carried on my shoulders. That I would wake up from my nightmare. Every time I walked into my College and Career class, I tried to stay positive about my future after high school. I wanted to be filled with excitement, become more vivacious and enthusiastic mentally and emotionally about attending college, but I couldn’t. I never really opened up and shared my problems with others. I was the friend in school that would bring cheerful, lively happiness to my peers and teachers through well wishes and jokes. When I revealed the truth about my identity, I thought that I could solve my own problems or at least find solutions on my own, but recently realized that I needed support. I couldn’t figure it out on my own. For the past two years of high school, I was never really worried about where I would be going after high school, after all I was going to be graduating from a NYC public high school with a NYS Regents Diploma like all my other classmates. 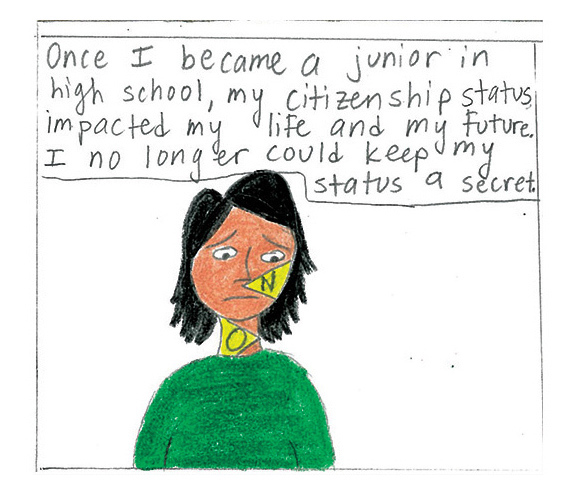 As a junior, I found out the hidden truth about my family that was going to affect me directly. 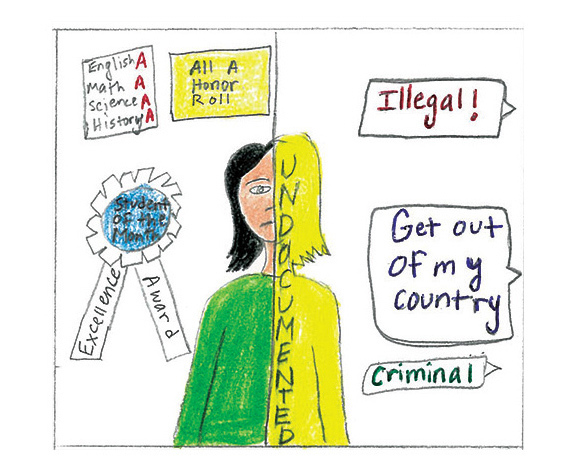 I realized there was something that my classmates had that I did not have: “papers.” Being ‘undocumented,’ or how some colleges like to identify us as ‘international students,’ was an undesirable status. 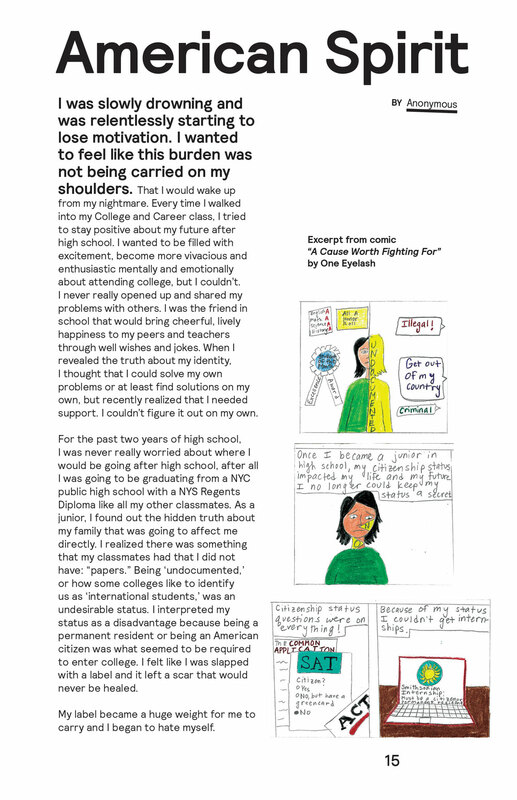 I interpreted my status as a disadvantage because being a permanent resident or being an American citizen was what seemed to be required to enter college. I felt like I was slapped with a label and it left a scar that would never be healed. My label became a huge weight for me to carry and I began to hate myself. I felt misunderstood and cursed. I wished I could just apply to colleges like my classmates, but I could not. I remained hopeful, praying for a miracle but nothing happened. 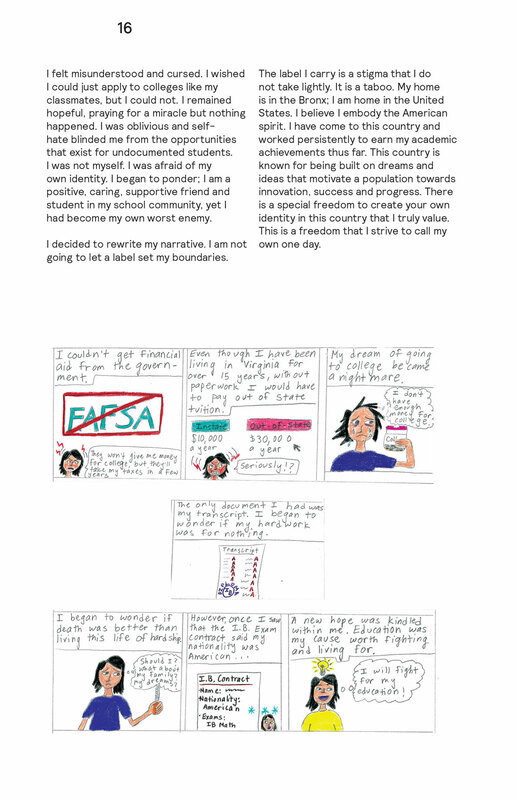 I was oblivious and self-hate blinded me from the opportunities that exist for undocumented students. I was not myself. I was afraid of my own identity. I began to ponder; I am a positive, caring, supportive friend and student in my school community, yet I had become my own worst enemy. I decided to rewrite my narrative. I am not going to let a label set my boundaries. The label I carry is a stigma that I do not take lightly. 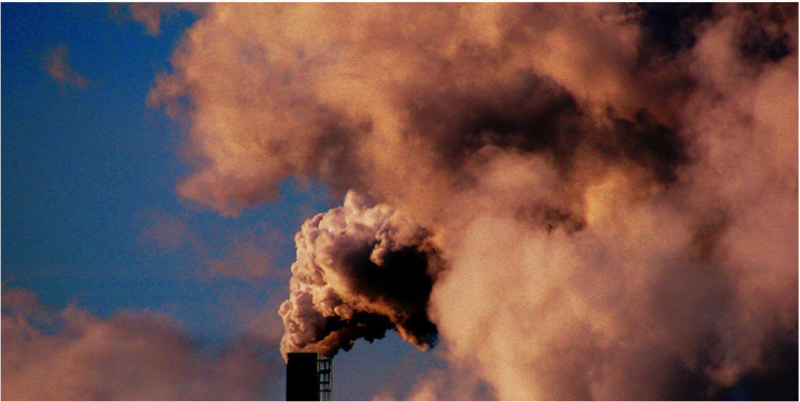 It is a taboo. My home is in the Bronx; I am home in the United States. I believe I embody the American spirit. 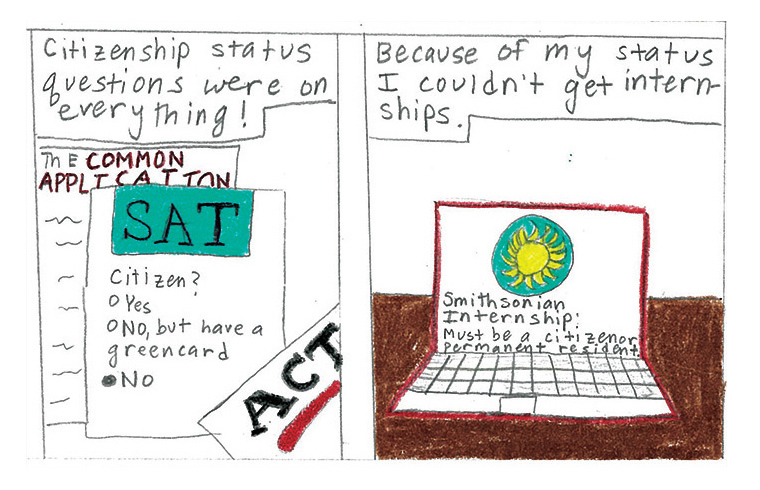 I have come to this country and worked persistently to earn my academic achievements thus far. This country is known for being built on dreams and ideas that motivate a population towards innovation, success and progress. There is a special freedom to create your own identity in this country that I truly value. This is a freedom that I strive to call my own one day. I adored the lightness of the soup, with its soft textures. 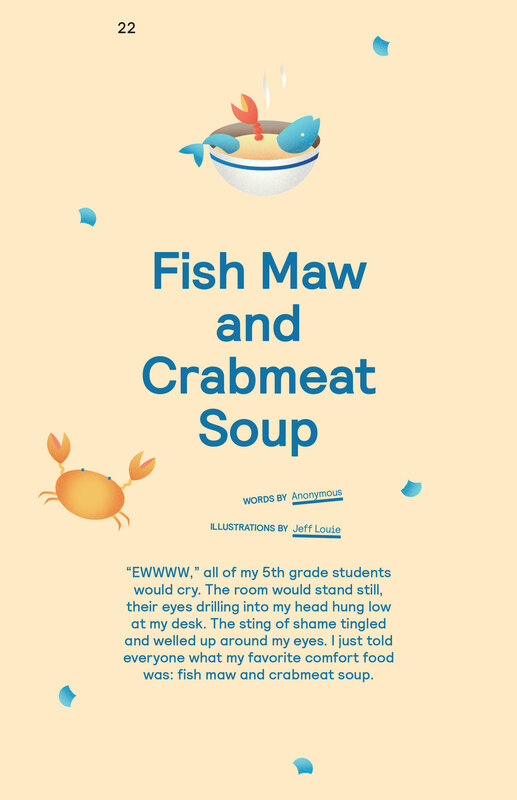 The soup has crabmeat and fish maw suspended in a light broth. The fish maw has a slightly gelatinous texture but it absorbs flavors very well, but the fact is that these are “air bladders” for fish. They are how fish maintain their buoyancy. Nevertheless, the natural briny flavor and the delicate sweetness was what I craved when I was not well. The paleness of the dish could have been a point of criticism for presentation, but seeing it my mother’s porcelain white bowls made sense to me. The uniformity enhanced this humble dish’s flavors in my opinion. The translucence was an example of how uninterrupted it was, a simple pure harmony of light flavors. This is how I pictured comfort food in my head. But I stuck out because I didn’t say something like apple pie or chicken noodle soup. I was embarrassed of my food, I was embarrassed that I had to explain what it was, I was embarrassed of the reactions I got. I was embarrassed of myself. Everything I ate was “weird,” and even the most inoffensive thing I could think of was subjected to the same reaction. I was always the weird kid, but at least when it came to my personality I had some charm, but my taste in food did not. Every day, kids brought in their Wonder Bread sandwiches with ham and cheese for a savory lunch or peanut butter and jelly for a sweet one. I only ever wanted those for lunch because cartoons on TV had that and kids at my school had that. These sandwiches were the ones that were featured, thrown in my face everyday that this was the norm and this was the only way to have lunch. The only sandwiches I knew were banh mi, toasted single-serving baguette loaves split in half and filled with slices of pickled veggies, butter, pâté, cilantro, cured pieces of pork, and julienned Thai chili peppers. The multitude of intense flavors is a far cry from the palette that PB&J’s hail from. Centuries of different influences including Chinese, French, and Thai in Vietnam gave birth to cuisine that would jam pack different flavors and elements into each dish. The tradition of variety coursed through me. 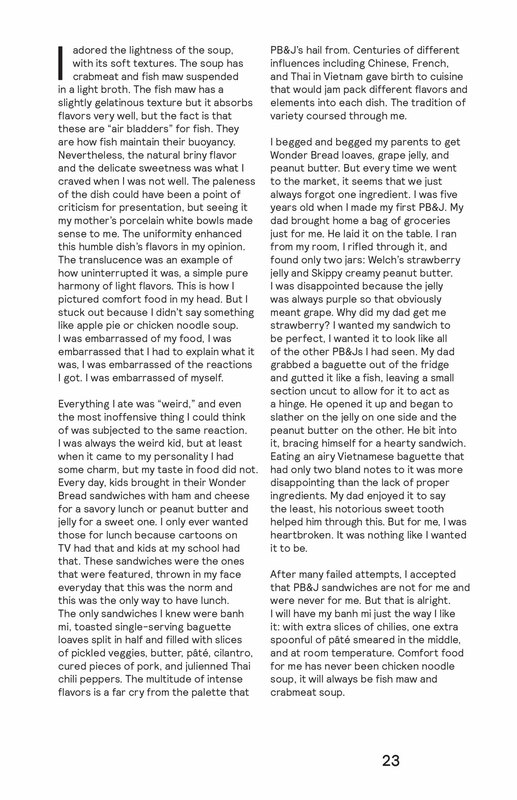 I begged and begged my parents to get Wonder Bread loaves, grape jelly, and peanut butter. But every time we went to the market, it seems that we just always forgot one ingredient. I was five years old when I made my first PB&J. My dad brought home a bag of groceries just for me. He laid it on the table. I ran from my room, I rifled through it, and found only two jars: Welch’s strawberry jelly and Skippy creamy peanut butter. I was disappointed because the jelly was always purple so that obviously meant grape. Why did my dad get me strawberry? I wanted my sandwich to be perfect, I wanted it to look like all of the other PB&Js I had seen. My dad grabbed a baguette out of the fridge and gutted it like a fish, leaving a small section uncut to allow for it to act as a hinge. He opened it up and began to slather on the jelly on one side and the peanut butter on the other. He bit into it, bracing himself for a hearty sandwich. Eating an airy Vietnamese baguette that had only two bland notes to it was more disappointing than the lack of proper ingredients. My dad enjoyed it to say the least, his notorious sweet tooth helped him through this. But for me, I was heartbroken. It was nothing like I wanted it to be. After many failed attempts, I accepted that PB&J sandwiches are not for me and were never for me. But that is alright. I will have my banh mi just the way I like it: with extra slices of chilies, one extra spoonful of pâté smeared in the middle, and at room temperature. Comfort food for me has never been chicken noodle soup, it will always be fish maw and crabmeat soup. Through years of intense survival. 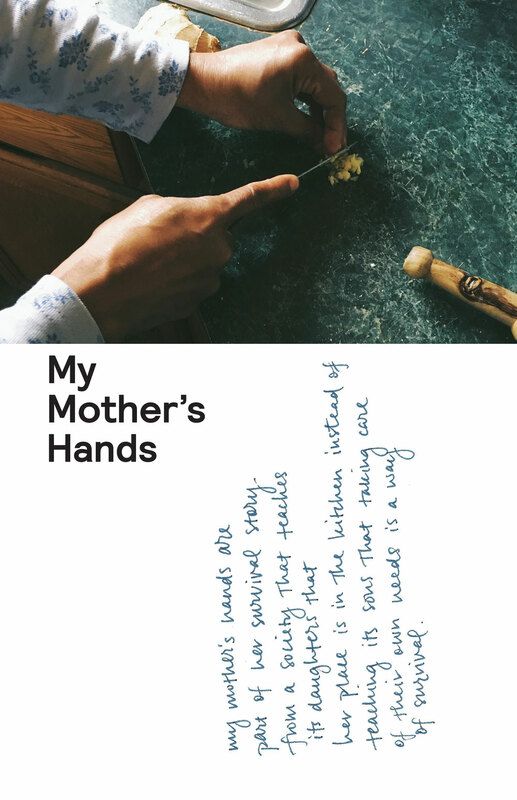 They tell me i’ve got hands like my mother. most opalescent of her moonstones. Last month, umma told me about the lady that she works for, got diagnosed with cancer. and we are poor and undocumented. ‘umma you are not super man,’ I let out a laugh. and keep her away from living. 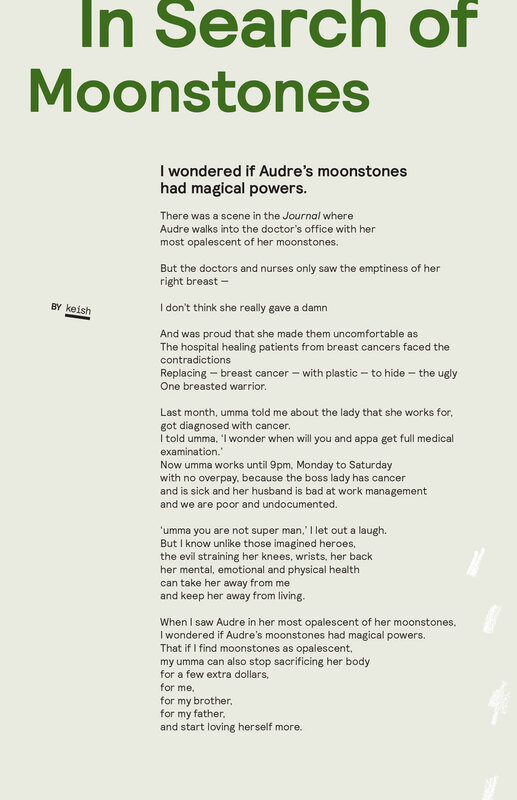 I wondered if Audre’s moonstones had magical powers. and start loving herself more. AMPLIFY(HER) is the first ever zine by & for undocumented women from the Asian diaspora, including trans women & gender non-conforming folks. The zine is a counter-narrative project that aims to empower and encourage women-led storytelling that is crucial to identity and survival.